Thomas and I will be attending the annual Disability Day at the Capital on Monday and Tuesday of this week. DD Day will be on Tuesday; however we will be up a day early so that we can meet with as many legislators as possible while we are in town. As advocates and a self-advocates it is important to stay connected with our state legislators. It is also important to be active on the national level. However, I have found that as advocates we can be more effective at the state level. The laws and budgets passed by the State of Florida directly and significantly impact the lives of persons living with disabilities here in our state. I have been advocating in Tallahassee since Jeb Bush was governor. I like to think that my efforts have had some level of success and have helped to make the lives of many Florida citizens better. The issues have remained the same for as long as I have been doing this. We need better employment opportunities and better transportation services. These two often go hand in hand. It is hard to find employment if you can not get to and from work. Persons with disabilities have a high rate of unemployment. Only 18% of people with disabilities are employed. Every year we fight to keep the Early Steps program funded. This is administered by Children’s Medical Services and is the Part C of the IDEA – Individuals with Disabilities Education Act. They provide early intervention services for 0 to 3 and serve over 40,000 children in Florida. History has shown that early intervention works. The Med Waiver has been under funded for a decade or more. We currently have over 20,000 people on the Med Waiver waiting list. Every year we work to increase funding in an attempt to reduce the waiting list and continue to provide community services for those who so desperately need them. Last session we saw and increase in funding and were able to remove over 1,000 individuals from the waiting list. However, we still have a long way to go. Every year the treatment of children with disabilities in our public schools is discussed. In 2010 we had the first significant legislation protecting children from the abuse of seclusion and restraint in our public schools. This year there is no legislation proposed so our children will remain vulnerable to abuse for another year. Each year we fight the same battles. Some years we make small steps and we celebrate our successes. It is sad that advocates for the most vulnerable members of our society have to settle for small incremental successes. However, that is the reality that over 20% of our citizens live with. That is the percent of people who have a disability. This Tuesday, March 18 you should hear the squeaking of wheels in Tallahassee. I hope that our legislators listen and appreciate how difficult it is for so many of our disabled citizens to make the trip to the Capital. We want to be listened to, we want to be heard and we want to be taken seriously. We will continue to keep squeaking our wheels for as long as it takes. Can cameras protect special-needs kids from abuse? A Fox news story from Texas. More school districts and states are looking at cameras as a way to protect children with disabilities in our schools. It is sad that we have to resort to monitoring or spying on teachers to ensure they do not abuse the children they are supposed to be caring for and teaching. ATLANTA (CN) – Parents claim two special education teachers assaulted and battered their disabled son so badly he died from the abuse. Ronald and Arthalia Hatcher sued the Fulton County School District, the Fulton County School Board, Fulton County Superintendent Robert Avossa, special education teachers Melanie Pickens and Katherine Dorn Durden, and 15 other Fulton County public school employees, in Fulton County State Court. The Hatchers say their son Aaron, a special-needs student, suffered abuse at the hands of his public schoolteachers, Pickens and Durden. But they say instead of caring for him, Aaron’s middle school and high school teachers abused him physically and emotionally. They claim Pickens confined Aaron in isolated places, physically restrained him and screamed at and berated him to punish him for “expressing himself,” and that Durden placed a homemade neck brace around his neck to restrain him. “Unfortunately, the Hatchers’ trust was misplaced,” the complaint states. “Unbeknownst to plaintiffs, Aaron began suffering abuse within Fulton County schools as far back as 2004. From 2004 to 2007, Aaron was a student at Hopewell Middle school, where he was in defendant Melanie Pickens’ classroom. “Ms. Pickens abused Aaron and other special needs students in her classroom physically, verbally and emotionally. Ms. Pickens’ conduct was investigated and her treatment of students was known to the school board. Nevertheless, plaintiffs were not made aware by the Fulton County School District of the abuse suffered by their son. “Unfortunately, escaping Hopewell Middle School did not mean Aaron’s abuse would end. Aaron suffered still more abuse at the hands of his special education teacher at Roswell High School, defendant Katherine Dorn Durden. It was while Aaron was in Mrs. Durden’s class that the plaintiffs first became aware that Aaron had been mistreated at Hopewell Middle School. “While in Mrs. Durden’s class, Aaron came home with bruises on his back and hands, making it clear that he was not being properly secured in his chair. Further, and without parental or medical consent, Mrs. Durden took it upon herself to twist and then constrain Aaron’s neck in a makeshift neck brace apparently because she did not like the way Aaron was forced to twist his neck in order to breathe. While a student in Mrs. Durden’s class, Aaron was repeatedly rushed to the hospital from school as a result of the abuse. “Plaintiffs repeatedly sent messages to the school about Mrs. Durden. They requested that Aaron be moved into a different special education class and had meetings with the principal, all to no avail. The Hatchers claim: “Defendants knew or should have known that defendant Melanie Pickens had no training or other credentials equipping her to teach students with severe special needs and that she was routinely and systematically abusing the children in her classroom,” but failed to act. The Hatchers seek compensatory and punitive damages for assault and battery, false imprisonment, intentional infliction of emotional distress, negligence, negligent hiring and retention, constitutional violations, and violations of the Americans with Disabilities Act, the Individuals with Disabilities Education Act, the Rehabilitation Act, and Georgia laws. They are represented by Jarrod Oxendine, with Oxendine and Sauls. Andre McCollins – a person with a developmentally disability is tortured. Previously posted on View From The Darkside of the Moon. Cases of abuse of people with developmental disabilities are not new, but sadly, they rarely make the news. This week, we heard about a mother who is trying to obtain the surveillance video footage of her son’s 2002 torture at the hands of the Judge Rotenberg Center (JRC) in Canton, Massachusetts. Cheryl McCollins wants to publicize the video of what happened to her son, but the JRC obtained a court order sealing the video. In 2002, Andre McCollins refused to take off his jacket when asked by a JRC staff member. In response, he was tied to a restraint board face-down with a helmet on his head. They kept him there for seven hours without one break — for food, water, or to use the bathroom. Whenever Andre screamed or tensed up, staff administered an electric shock for a total of 31 times. After three days in a comatose state, Andre was taken to Children’s Hospital, where he was diagnosed with acute stress response, which is similar to post-traumatic stress disorder, caused by the electric shocks. The JRC’s lawyers asked the courts to seal the video of Andre’s torture because, according to them, the public won’t understand it outside of “context.” There is absolutely no context that can justify torture. Even in cases with individuals with the most severe behavior problems, there are programs at other institutions with proven efficacy in reducing dangerous behaviors without using electric shocks or depriving students of food. Although experts in the developmental disabilities field have testified repeatedly against the JRC, you don’t have to be an expert to understand that what happened to Andre is torture. But the JRC doesn’t want you to believe that. They will continue to get away with their abusive practices unless someone lets the public see the video of what they did to Andre in the name of treatment. This incident may have happened ten years ago, but the wounds are still raw and gaping. Andre hasn’t forgotten what happened to him, and neither has his mother. Andre will have no justice for as long as the JRC can bury the video of what they did to him. At its heart, this is a human rights issue. Those in positions of authority have a moral obligation to protect the rights of people like Andre against the interests of the JRC, and to let this video become public so that Andre can finally have justice. The video of his torture at the JRC needs to be released to the public, and it needs to be released now. The JRC is the only institution in America that still uses electric shock aversives as a means of “therapy” for its residents. Their aversive interventions also include food deprivation, restraint, and seclusion. The United Nations condemned the JRC’s practices, and the U.S. Department of Justice opened an investigation into their activities in 2010 after several reports of the activities of the JRC. For close to three decades, advocates have tried to close the institution, but have repeatedly failed to successfully pass legislation to end the use of aversives. Massachusetts’s Department of Developmental Services enacted regulations in late 2011 that prohibit the use of the electric shocks on any newly admitted student, but which grandfather in any student who was court-approved to receive the shocks before their enactment. The JRC is still operating, and for them, it’s business as usual. They don’t want the public to see what they do, because they know that the public will know intuitively and correctly that what they do is not treatment; it’s torture. Advocates of disability rights who oppose restraint, seclusion, and aversives have long held that restraint, seclusion, and aversives are ONLY appropriate as a one-time, temporary and emergency response to a specific situation, as a last resort, where there is an immediate and imminent threat of harm to self or others. In this respect, aversives can be necessary as a last resort and as an emergency and temporary measure. They have no proven efficacy in the long-term to reduce and eliminate problematic behaviors such as self-harm or hurting others or destroying property. If they did, then why would some JRC residents still be there after five or ten years, or more, and still have the same behavioral profile, and still be receiving the electric shocks? The answer is that they wouldn’t. The JRC claims that its techniques save lives; this is misleading and dangerous. Aversives have no efficacy as a long-term treatment, and can cause Post-Traumatic Stress Disorder and otherwise be very emotionally damaging to people subjected to their use. You can read more about the JRC and restraint and seclusion and aversives issues at http://www.autismeducationproject.org including reports from a number of government and non-profit organizations. The abuse and torture of the disabled must stop. Students Traumatized in Special Education Across America, Seclusion, Restraint, and Aversives Scream Rooms when will America say enough is enough? A urine soaked scream room. A child stuffed in a duffel bag. Vinegar soaked cotton balls put in a child’s mouth. Slapped on the head with plastic bottles. Child dragged through a playground across asphalt with pants down. Shoved to the floor and dead from asphyxiation. Handcuffed and duct-taped. Degraded. Dehumanized. Traumatized. Mob stories? No, it is just a scratch of the surface of what has happened to children in special education in the past year. Not in a third world country, but here in America. From the West Hartford News. A reporter who is the mom of a special needs student. The abuse of our children with special needs and disabilities has to stop. We need to keep making noise – keep squeaking those wheels. Here is a follow up on the “Scream Rooms” that are being used in Connecticut public schools. Please click to view news video. Sexton says it’s because his son, Robert, spent too much time alone in a small room — sometimes called a scream room, a timeout room or a safe room — as a way to control his behavior at a public school run by Area Cooperative Regional Education Services in North Haven. Sexton heard about the outcry in Middletown last week when parents learned that children with troublesome behaviors at Farm Hill School were put into a 10-by-6-foot room with a window on the door — as a place to calm down. Sexton said he was glad to hear that people were speaking out against the use of these rooms. Many national and state advocates for children agree, and say that “scream rooms” or seclusion rooms should be banned, calling them untherapeutic and harmful to children and to the school community. Jane Hudson, a senior staff attorney with the National Disability Rights Network in Washington, said there was no evidence that secluding a child had any therapeutic value. In Connecticut, a group of attorneys and advocates for children with disabilities filed a complaint Friday with the Office for Civil Rights of the U.S. Department of Education, charging that the practice of using the seclusion room chiefly or exclusively for children with special needs at Farm Hill School violates their civil rights. U.S. Sen. Thomas Harkin, D-Iowa, has introduced legislation that would ban the use of seclusion rooms for children in schools. The law goes on to provide information about how and when a child can be secluded and calls for frequent monitoring and notification of parents when a child has been in a seclusion room. The outrage in Middletown erupted when parents said they witnessed two school staff members holding a door shut on a “scream room” while a child inside kicked and screamed uncontrollably. A meeting was held last week at which parents said that their children were distracted and intimidated by the screaming, and at least one child said that it was “scary” and made it hard to concentrate on her work. At a press conference Friday, Middletown Superintendent Michael Frechette addressed an issue that has been of concern — the occasional use of the timeout rooms by students without IEP programs. “I wanted to make clear that I have directed all administrative staff in the district to cease, immediately, using timeout rooms for students who do not have specialized, legally created IEPs,” Frechette said. It is this practice — using the rooms chiefly or only for children with disabilities — that prompted the complaint filed against the Middletown public schools on Friday by 19 Connecticut lawyers and advocates for children with disabilities. James McGaughey, executive director of the state Office of Protection and Advocacy for Persons with Disabilities, said that he was broadening the scope of his office’s investigation at Farm Hill to include another elementary school in Middletown and possibly others. His investigation will look at whether any abuse or neglect has occurred at the schools. The use of seclusion rooms appears to be widespread in Connecticut, McGaughey said, because his office has been receiving calls from parents in other towns who also are distressed with the use of timeout rooms at their children’s schools. Michael Sexton said that when he enrolled his son, Robert, in the ACES school in North Haven, he was told that a timeout room might be used for his son. “They said they don’t use it often and they won’t put him in there unless they have to,” Sexton said, but he said that Robert, who has attention difficulties and epilepsy, came home complaining that he was put in the room almost every day. Sexton said that his son began begging not to go to school. After about 18 months at ACES, Sexton said that he withdrew his son last spring. Now Robert attends a school run by the Wheeler Clinic in Plainville. Robert’s experience at the Wheeler Clinic has been much better, Sexton said, but his son still often begs not to go to school even though a timeout room is not used there. “It’s post-traumatic stress,” Sexton said. A student might be sent to a timeout room, he said, when they “can no longer successfully learn in the classroom because of their behavior” or when they are a danger to themselves or others. She said she knows of a kindergartner who was locked in a bathroom and spent the time rocking back and forth, banging on a pipe. When the child went home, her mother found a softball-sized bruise on her back. One mother said that her 10-year-old son, who is mildly autistic and attends a public school in the Farmington Valley, is in a timeout room almost every day, sometimes spending an entire afternoon there. She said she believes that he winds up in the room — often with the door open — because his educational program is lacking and because staff are not sufficiently trained. “My issue has always been, if you don’t think you can handle my child, then you need to ask for help,” she said. A timeout room should be “a last resort,” she said, not something that happens every day. Ross Greene, the author of “The Explosive Child” and “Lost at School” and an associate clinical professor at Harvard Medical School, said that the use of timeout rooms could be greatly diminished if schools were more pro-active. Throughout the country in recent years, he said, there’s been a move to dramatically reduce the use of seclusion and restraints in juvenile prisons and in mental health inpatient units. When students begin spending a lot of time in seclusion rooms, Greene said, it’s a clear indication that a child is not understood and is not receiving the care he needs. Greene said that much of this trouble can be avoided if an effort is made to help kids acquire crucial skills: flexibility, frustration tolerance, problem-solving and others. “I think we should be bending over backward to not be using them and to not be needing them,” he said of the rooms. Keep squeaking your wheels. This has to stop. Can you imagine we need Federal legislation to keep children with disabilities safe in our public schools. That is almost unimaginable. What is even more unimaginable is that the children need to be kept safe from their teachers and other school personnel. Wow – sad but true. Last year in Florida there were over 10,000 incidents of restraint in our public schools. Nearly 5,000 were on students with disabilities in pre-K to 3rd grade. If the states will not protect the most vulnerable children in our schools then I guess it is time for the Feds to step in and protect them. The Keeping All Students Safe Act was introduced in the Senate by Chairman Tom Harkin this afternoon. Chairman Harkin has shown an unwavering commitment to the safety and welfare of our nation’s children. This bill would promote the development of effective intervention and prevention practices that do not impose restraints and seclusion; protect all students from physical or mental abuse, aversive behavioral interventions that compromise health and safety, and any restraint imposed for purposes of coercion, discipline or convenience, or as a substitute for appropriate educational or positive behavioral interventions and supports. Importantly the bill also works to ensure the safety of all students and school personnel and promote positive school culture and climate. For more information on the Keeping All Students Safe Act. Keep squeaking those wheels. School is not supposed to hurt. By Richard S. Stripp, Sr. The children and adult characters in this book are based on students and individuals that the author has interacted with and/or worked with directly. The majority of children who “speak” in this book are non-verbal. Their words which you will read are fictitious and were never spoken by them but are based on actual events that occurred in their lives. It is the author’s belief that if the non-verbal children in this book could speak, what you are about to read is what they might have said. Any conversations between the author and anyone in the book are based on actual events and conversations. “I can’t believe that Mom is making me go to school again today. Doesn’t she know what they do to me there? Doesn’t she love me anymore? “Adam, you hid your shoes again. This isn’t funny. It’s time for school.” Yeah, I know it’s time for school; I don’t want to go, that’s why I hid my shoes. Man, I wish I could speak. I wish I could tell Mommy what they did to me at school yesterday. 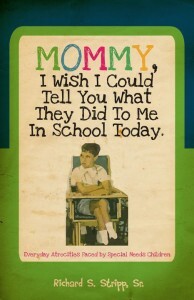 I wish I could tell Mommy how it makes me feel to be treated like that. If she only knew, there is no way she’d make me go there today. I bet Daddy would beat them up. The day started like most days. They took me off of the school bus and strapped me into that stupid wooden chair. My pull-up was soaked with pee but they didn’t even check. I just had to sit in it until I wet through. Then, the yelling began. Like it’s my fault I had to go to the bathroom again. I was trying to tell them. Kept on touching my private area; what did they think I was saying? “That’s disgusting, Adam. Knock it off!” Knock what off? I’m soaked. I’d change myself if I could, but I can’t. Sad but true and this is not an isolated incident.